If you have been following me on social media for some time, you may have known I had a second blog dedicated to my entire house referb, interior trends, being a first time home owner, etc. As I simply don't have the time to update the blog very often, I decided to rewrite my blog posts and add them to my main blog, Queen Bee Becca. So I thought I'd share my complete and utter kitchen referb! Feburary last year finally saw us move into our first ever home. After months and months of utter chaos and it almost falling through, we were over the moon. Sadly the dream was short lived when we arrived and found the house in a complete and utter state. We purchased our house with the knowledge that it was going to need a lot of work but we thought the majority of it would just be cosmetic. Sadly a mere 24 hours into our new home we discovered that there were water leaks, gas leaks and our boiler didn't work. However it did mean that work we planned on doing slowly over the year, had to be done immediately and this started with our kitchen. Apart from it being hideous, most of the cupboards were broken, the oven leaked gas and the sides were so dirty and battered we simply couldn't face using them. It meant we lived on take aways for about three weeks after moving in while the kitchen got completely gutted. All we can say is the previous owners loved red. The whole house was various shades of red paint or red floral wallpaper but I'll save those visual treats for another time! Once we'd found a builder we were happy with, the exciting bits started - designing our kitchen. We decided that we loved the breakfast bar but hated the radiator and amount of space it took up, so that was all to be changed for a usable breakfast bar, cupboard space and a kick heater. 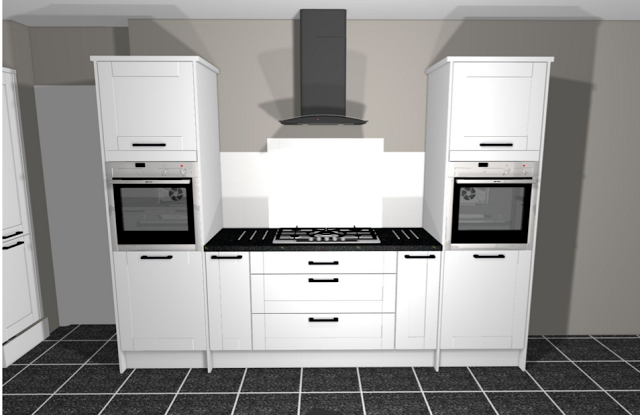 We weren't ultra keen on the oven set up either and decided to have two 'towers' with slide and hide ovens (hello GBBO!) and a central hob with massive, deep draws for pots and pans. Once we were happy, the fun really began! Seeing the hideous red and red floral tiles getting pulled from the walls, words can't even describe! From starting to gut the kitchen to it being complete took around 2 weeks. Those two weeks felt like forever! Watching all the red disappear was lovely though, it really felt like at least one room was ours finally. 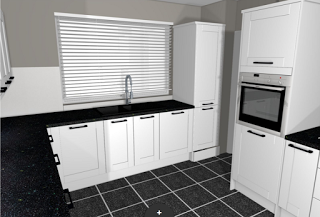 We decided on white cupboards, black granite counter tops, a built in dishwasher and wine fridge, two ovens, a gas hob and white glass splash backs. These photos were taken when the kitchen was about a week old, you'll have to excuse the bits everywhere but as we were still very much unpacking boxes, the whole house seemed to have items yet to find their new home! I love my new kitchen, I'm a sucker for the under cupboard lights and now it's all white, grey and black it feels so much bigger and brighter! 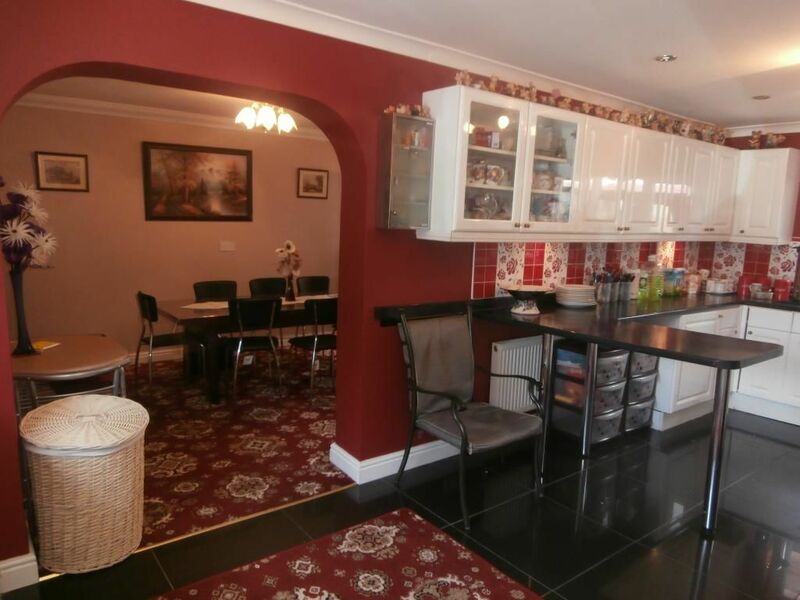 What do you think of my kitchen transformation? Love it! Looks amazing and love the idea of 2 ovens! Genius! 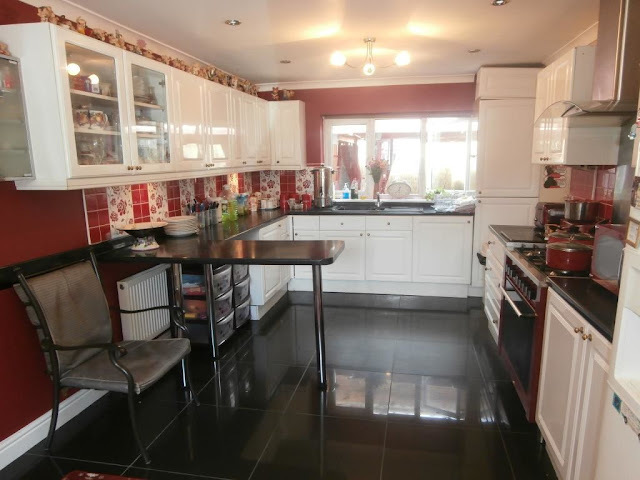 A roast must be a doddle in your awesome new kitchen. I am same with under cupboard lights! I was shocked when found them when we moved in. Looks so beautiful!